I haven't seen any rabbits hanging around my garden for several weeks now. Where are they? I uncovered the peas, lettuce and spinach, and so far, the rabbits haven't eaten them. Perhaps I have successfully banished rabbits from my garden? I am hopeful, but doubtful. I know those rabbits are out there, somewhere. I must remain vigilant. 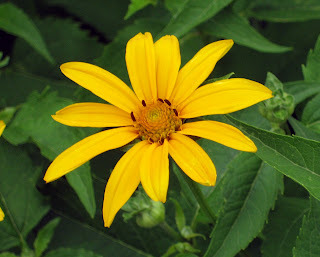 But I have banished Heliopsis helianthoides, False Sunflowers, from my garden. They were messy and self-sowed themselves in many places. That's a good thing if you are planting a prairie-style garden, not so good if you are trying to have a nice grape arbor and a semi-neat perennial border. It all started innocently enough when I purchased Heliopsis helianthoides 'Lorraine Sunshine'. It had the most wonderful variegated foliage! So I bought it, planted it, and loved it that first year. Then there were seedlings, and some were variegated like the parent plant and I was happy. But others were plain, the species. And they grew and flowered, too, and I let them be. Soon I had many false sunflower plants and I planted them here and there, and even around the grape arbor. But they turned out to be thugs. They made a mess of my garden. They grew everywhere and cast their seedlings about the garden. So on Saturday, I banished them from my garden. I cleaned up the bed around the grape arbor and took them all out, along with all the weeds they were harboring around them, including dandelions and grass. This is what the grape arbor looked like before I banished the false sunflower. Here's the same bed after I weeded and removed all the false sunflower. My primarly tools were the short-handled Cobrahead (love it!) and a pitch fork. And here's the bed all mulched up. I left some daylilies around each post, but otherwise, this bed is cleaned up and free of false sunflowers. They have been banished, unceremoniously dumped in the compost bin to become compost. Let the the grape vine grow in peace. But just as I must be watchful of the rabbits, I must be watchful of the false sunflowers. You see, over in the perennial border, I left the variegated 'Lorraine Sunshine'. 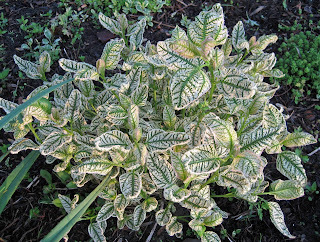 I couldn't bear to get rid of its beautiful variegated foliage. I was weak, maybe foolhardy. Time will tell. But I promise to my garden and my grapes that now that I know about the self-sowing habit of the false sunflower, I'll be careful and watchful. Really, I will. I've learned my lesson. Plain green false sunflower seedlings will be treated like weeds and promptly removed from my garden... when I get to them, hopefully before they flower. Have you banished any plants from your garden this spring? carol - that Lorraine Sunshine is just beautiful! you are really making me feel like i oughta go out and get a cobra head. I usually deal with the self-seeding problem by deadheading, but this year I decided to eradicate all of the Hydrophyllum virginiana from the garden. It was popping up everywhere, far from the parent plant. Its flowers aren't that great, the foliage is interesting only until May, & its roots are long & stringy. Definitely not as nice as 'Lorraine Sunshine.' I can see why you'd want to keep it. I also am trying to get rid of Asclepias syriaca, the plant that tried to eat the Prarie Garden. I'm replacing it with the better behaved Asclepias purpurascens. I'm still trying to get rid of a campanula (not sure what variety) that I planted years ago. I started trying to eradicate it about 10 years ago after it started taking over the garden and it still pops up. Its seeds have crossed two fences, from the front yard to the back yard. If I leave the tiniest root in the soil they pop back up, and the roots break easily so I can never get them all. I am trying to banish Himilayan Balsam (Impatiens glandulifera) from my garden. My mom gave me one of these when I first started my garden from scratch, saying that it was a nice easy plant. Didn't mention that the seeds launch themselves across the garden, and every single one of them seem to germinate. I found one that sprouted in gravel, under my deck. For YEARS I have been trying to banish bamboo from my yard. It was great for a few years when it stayed neat in about a 5'x10' area. But then it came up everywhere including only a few feet from my grouchy neighbors yard! That is when the banishment began. I dug deep trenches along the neighbors border to keep it from spreading there. I have successfully banished the above ground parts but just like your rabbits, it is waiting until I'm not looking to sprout up again! When I tilled the new area to expand my vegetable garden I found bamboo roots. That is over 100 feet away from the original planting - Yikes! Keep watching for those rabbits and false sunflowers Carol. They will appear again when you least expect them! I am relieved to hear you didn't ditch Lorraine Sunshine. I agree that false sunflower can be a thug, but I don't think the seedlings are that hard to get rid of. I have 'Summer Sun' false sunflower (or maybe just progeny at this point) but it is in a bed of other thugs such as creeping bellflower (which may be what daphne has), Artemisia pontica, Achillea ptarmica, bee balm, and various asters and goldenrod that have snuck in. I pulled out Malva alcea 'Fastigiata' a couple of years ago, and I am still pulling up dozens of seedlings every year. They quickly develop tap roots and need individual pulling, a tedious chore. There are all manor of thugs in my wild garden that I work to banish...right now it's Virginia Creeper...it's lovely and provides food but it is very naughty and takes over. Goldenrods are very aggressive and have gotten into the sunny bed and are two feet tall before you know it! Hi Carol, you did a good job on the grape arbor, any plans for additions to the area, it looks a little bare? ;-> And where are your rabbits? Did you trap any? Maybe one of your neighbors did. The Lorraine is a doll. Your grape arbor looks so nice and neat. I have a thug of a sunflower in our garden. Some people call it Jerusalem Artichoke. I planted it by the fence when I didn't have anything that would grow there and it was polite for about one year. Then it started to take over. I have been trying to get rid of it ever since. I can't even throw it on the compost pile because it just sets down root anywhere. You can dead head these things to your hearts content and they will still spread by root, tenacious plants. Gina, if you do any kind of hand weeding, like grubbing grass out of flower beds, you ought to try the Cobrahead. Mr. McGregor's Daughter, I had to look up that Hydrophyllum and realize I have some of that, too. I've been pulling it as I see it as I assumed it was a weed that came in with some passalong hostas years ago. Daphne, Interesting how many of us actually planted what we are now trying to get rid of. Chzplz, Yes, beware of the "nice, easy plant". Nancy J. Bond, Thanks, so far, this year I am winning the battle with the rabbits. Marc, Yikes! Bamboo! I have been very careful to stay away from bamboo, I don't want to get seduced by it and think I can plant it and control it! Kathy, A garden of thugs. I bet that is a sight to behold by the end of the summer! Gail, It is a never ending task, isn't it, to get rid of those thugs. Frances, Right now, I like the clean look around the grape arbor. It will look less bare as the grapes continue to grow (I pruned them back hard this spring). And what worries me is I don't know where the rabbits are. I didn't trap them, just haven't seen any for awhile. Maybe one of my neighbors is successfully trapping them for me? Lisa at Greenbow, The irony of it all, that many of the plants we are trying to get rid of we actually planted and welcomed into our gardens at one time. Thanks all, for sharing about your banished plants. I haven't had to banish any plants from my garden yet. Hopefully I won't have to either. I doubt it though. My garden is less than a year old after all! I'm banishing thistle. Everything else gets a chance to stay and be nice. where do you live (close to Greenwood?) 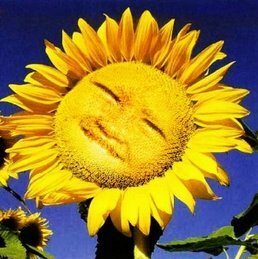 - I would LOVE your heliopsis. I cannot get mine to live and love the orange-yellow of the flowers. My garden is overrun with invasive bee balm which grows over 6 feet. I am still trying to get rid of my Houttuynia. If you would like some to replace your Heliopsis I would be glad to send it to you. I would even throw in some Canadian thistle for free! I winter sowed 'Lorraine Sunshine' last year, but it didn't flower last summer. It's back again and hopefully will flower for me this year! I too love the variegated foliage! Thanks for the warning about it!